For years I have loved Old Dutch Sweet and Sour Salad Dressing. It is a little hard to find locally and when I do it is priced higher then most other salad dressing. So I started looking for a recipe that tastes almost like it. Most Pennsylvania Dutch Sweet dressing recipes have oil, egg or cornstarch in them that I have found in old cook books. But I wanted a light dressing that had no thickeners or oil in them. I realized I was going to have to figure this out for myself using the spice measurements and my own non oil base from the recipes I had found. After several tries and adjustments, this is the recipe that I like and it almost tastes the same as the commercial bottled brand. In a small sauce pan heat water and sugar, stirring until sugar is dissolved. Remove from heat and let cool for 10 minutes or until cool enough to pour in food processor or blender. In food processor with blade or blender, add all other ingredients with sugar water. Blend for 30 seconds. Store in refrigerator until use. This recipe makes about 2 cups of dressing. It keeps several months stored in a jar in the refrigerator. This dressing can be made with sugar substitute and is ideal for special diets. You can adjust the spices to your taste. I also recommend cutting the recipe in half the first time you make it so you are not stuck with too much dressing that you don’t like. Making your own is so much cheaper from pantry staples that are low cost. I buy my spices from the Dollar Store or the bag type that you find now at the grocery. I now very rarely buy bottle dressings for my salads. 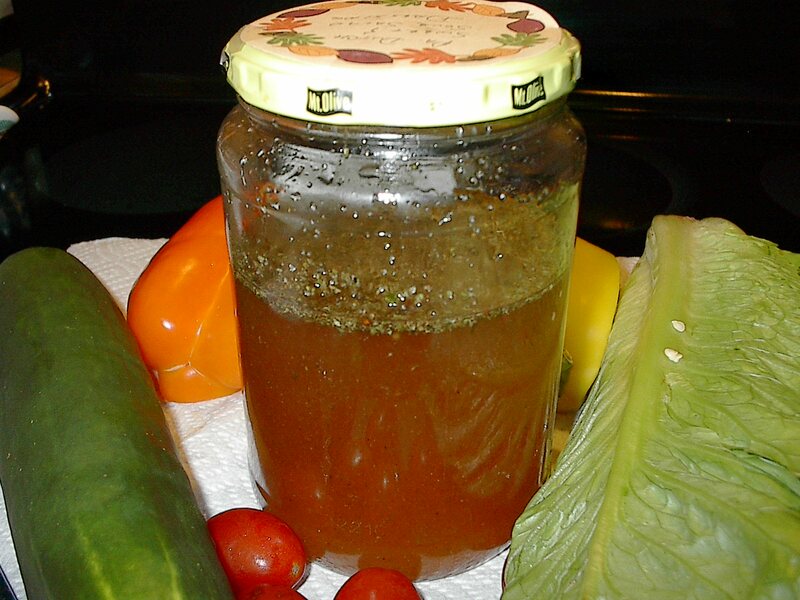 You may enjoy my other salad dressing recipes. I am all for making my own dressings. Once you learn that they’re easy to make and so much healthier than their store-bought counterparts, it becomes harder and harder to justify purchasing one. I’ve not heard of a Dutch sweet and sour dressing but am definitely willing to give it a try. Thanks for sharing. You will like it. It only takes a little on a salad. It is really good on just plain greens salad. I had computer problems and just got it fixed so now I have 1200 emails from wordpress to go through. It is going to take a few days to read them all. Thanks for your comment. Thanks. I love reading them. Thank you. I had another issue with the computer after I had it fixed. So it now needed a complete restore. Now it is running great. I have missed everyone. I always make my own salad dressing. This is great with no oil or thickening agent. Yummy! Pumpkin pie spice was a nice surprise. Sounds interesting. Have never heard of it. The Pumpkin Pie Spice must make it really tasty. Actually it does. You can add a little heat to it if you like. I am finally back on the internet. Had my share of computer trouble. I missed my freinds. Thanks for your comments. pumpkin pie spice? paprika? I’ve never seen a recipe like this, but it looks fabulous– lots of flavor!! thanks for the post– I’ll give it a try! I’m going to try it! Looks fairly simple. I’ve been looking for easy homemade dressing recipes. It is easy. Make a little and see how you like it. Thank you for your comment. I’ve never heard for this kind of dressing but since you said it was low calorie AND I have all the ingredients so I’m going to giving it a go! Just use your sweetener that your diet allows. You can adjust it to your taste. Thanks for sopping in. I have had computer troubles but I now think I am fine. I have missed all my freinds and plan to catch up reading their blogs. So glad you are back! I was thinking of you just the other day – missed ya! mmm–I’m going to have to try this recipe. My mother used to make great sweet and sour dressing–but when I’ve tried to make it, the dressing has never turned out quite right. Yes, some of the ladies had a nack for making it. It was the nack that didn’t seem to get passed on. I have miss reading about Helena. My computer has been a problem. I think it is fixed now. You’re right–there does seem to be a knack in making it. I tend to overcook or undercook it. Glad to hear that your computer is fixed. This sounds really good!! I am not a fan of most store bought dressings. Thanks for stopping in. I have had some software problems and it took a while to fix. I look forward to catching up on your blog. Just found this blog. I love Old Dutch Sweet and Sour Dressing, but I have never used it on a salad. I use it as a marinade for chicken breast before grilling. It is also a good marinade for fish before grilling. I just grill my fish on the George Foreman and add a little Asian seasoning while cooking. Really quick, easy, and light. Perfect for dieting! I will give the homemade version a try. Thanks. can’t wait to try it! I worked at Dutch Pantry in High School and loved the salads and they were so simple, lettuce, Swiss cheese & croutons. that’s it. I am back, And thanks for waiting. My mother used to make a dressing like this for coleslaw using Miracle Whip instead of oil. She used vinegar and sugar but no spices. Many people still do make that dressing. It tastes great on slaw and cucumber salads. Thanks for your comment. I live in Pennsylvania and this dressing is everywhere. I am not sure what ingredients they use but the restaurants have it on their menus and the grocery stores sell it. My son lives in Lancaster County and the Amish sell this in their stores. I love it! I was surprised that you had pumpkin spice as an ingredient. Sounds good! This is pretty close to the bottled dressing. My parents were from Pennsylvania.. You can adjust the spices to meet your taste but once it is on the salad it can pass for the bottle dressing. Thanks for stopping and commenting. Thanks for liking my posts. Your design popping up at the bottom of my posts is very encouraging. You are welcome. I enjoy your posts. Thanks for stopping by and liking my home made pizza recipe. I want to try this recipe of yours but I don’t think I can get pumpkin pie spice in Scotland. Can you suggest an alternative, or can I make it up myself from a selection of the spices for its ingredients? Thank you. Thanks for coming by. I hope the answer to your question in the e-mail helps. Yo también sigo tus propuestas. Esta se ve que es fácil y deliciosa. Gracias por venir y tomarse el tiempo para comentar. Disfruto de sus recetas y fotos. I sent you permission a week or so ago. We had a bad summer cold that we passed around so I was a little under the weather. I am trying to get caught up now. I am really glad you like it. This is my top recipe on this blog. It gets the most views. I used Old Dutch when I was on a diet, and was looking for it again recently. Couldn’t find it anywhere except for the net, and it was crazy expensive to order it online. Thanks for the hit on the homemade! I will be using it for my personal use everyday and I will be offering it as a salad dressing at my daughter’s rehearsal dinner! Thanks for your comment. I just got the notice of the comment in my email. Who knows why? I do hope it turned out well for you. I can’t wait to try this! I hate buying dressing that have ingredients that I can’t even pronounce in them. Thanks for stopping in. When I first posted the recipe I had no idea so many would respond over the last couple of years. I hope you enjoy making this recipe your own. I am thinking of republishing it with a better picture. Thanks for your comment. My grocery store just stopped carrying the Old Dutch Sweet and Sour. I am so happy to find your recipe. I am going to make some today! Thank you so much. You and adjust the recipe to your own taste in spices. Thanks for commenting. At one time it was made by a company out of Pennsylvania when I was young. My guess is they did at one point. They kept the same label and bottle shape but dropped the Pennsylvania. I noticed the last time I was in Publix that they didn’t have it. When ever I bought it, there would only be a couple of bottles left on the shelf. I always assumed it was very popular. That was why I shared this old recipe. They are very close to the same taste. I think you will enjoy it on your salads. what an interesting recipe! Will give it a try. thank you. I hope you like it. Thanks for commenting. I have never heard of this dressing…but have already made a copy into my recipe file and going to try it. I am intrigued with the spice combination. Sounds delicious! Thanks for sharing your tried and true recipe! It was popular in the North East and was sold in stores. It used to be carried here in Florida but is no longer on the shelves. I don’t know if the company went out of business or not enough demand for it. You are going to like this because it is light and not heavy like other dressings. Thanks for stopping in. Can’t wait to try this. My mom has used Old Dutch on her pasta salad since I was a kid and it’s a major favorite of our friends and family. My local grocery store just stopped carrying it and it’s not easy to find. Thanks so much for sharing! I was told that they no longer make it. And thanks for the comment. I do hope you enjoy it. This reminds me of my grandmothers salad dressing. There always was some sugar in it. going to try this tomorrow. When I made this recipe to copy my favorite commercial bottled dressing 4 years ago, I had no idea that the company was going to go out of business. I am just as astonished at this as you with the response. Half my daily stats is just for this recipe. I appreciate your recipe and am going to give it a try. I have used Old Dutch sweet and sour dressing for years and it is no longer available. After looking for it everywhere, I decided to phone Reilly Foods, maker of Old Dutch and find out who was carrying it as Kroger, Publix and Walmart no longer stock it. Much to my dismay, a representative told me that they were no longer making it and without asking for it, she also proceeded to inform me the recipe was not for sale because they were actively trying to sell it. When it was carried by the big box stores, I always found it to be extremely reasonable, less than $2.00 most of the time. It was a very light dressing, of course, with no oil and I am so going to miss it. So, I do hope your recipe comes close and I am going to find out. Thanks. Thanks for your comment. Ingredients are listed with the most used first.on a product label. I opted to use a simple syrup from cane sugar instead of kayro corn syrup because it is better for you. Keep your bottle for a taste test if there is some left. It took me several batches to get the spices right. Pumpkin pie spice seemed to come the closest to the flavor. Pumpkin pie spice is easy to find this time of the year at the grocery store. I used McCormick brand. I have used other brands and didn’t see any difference. I left the corn starch out because it seemed to coat the salad just fine with out it as a thickener. . Thanks for the response and info. Will be trying your recipe out in the near future. Appreciate your ground work to date in replicating this recipe as it is disappointing that Reily Foods no longer offers Old Dutch. Finally made it following your recipe. Tastes great and very close to Old Dutch store bought version. Tks again. Mike K McCaysville Ga.
I’ve been using Old Dutch since my mother in law introduced me to it many years ago. Being Italian she mixed it with Extra Virgin Olive Oil and White Balsamic Vinegar for a sweet Italian dressing. It’s all we’ve every used. Everyone I ever introduced it to started using it. I’ve used it in many recipes and as a marinade. My daughter and I ordered $50 worth at a time from Wal Mart since that was the cheapest you could get it. And we ordered several times a year! When we realized it was discontinued we too called Riley foods! Sounds like it may someday be back on the market but in the mean time I have been trying to perfect this! While this is close I have made a few additions and subtractions and am to the place where I think it is near perfect. I plan on canning it by the pint. We were paying $2 for an 8 oz bottle and I can make it for less the fifty cents. Even if it comes back we will probably be making our own from here on in! Thank you for posting this! It is very inexpensive to make. The nice thing about making it yourself you can adjust it to your taste. Can you elaborate on the modifications you made to the recipe? Could you send your recipe that you have adjusted? I have grown up on this salad dressing and not being able to find it in the stores any more is very upsetting, how ever after many searches to find the truest recipe out their and believe me I’ve tried them all this recipe comes the closest. Thank you so much for your time and effort in getting this recipe out their for all to try. I still saved one last bottle – but it’s empty. Might be a treasure one day!!! Momoe: Whaz up? I thought I was following you but nada for months. Someone commented on this recipe so I “found” you blog again. Did you do something so that you’re only on the Reader now? Cuz I don’t do “reader”. Good to “see” you again. I used one of your recipes and a photo on one of my blogs….so thank you. I’m really depressed…guess why? Wow…great recipe! I would never have thought to add Pumpkin Pie Spice, but is sounds terrific! This is my most popular recipe. Google has picked it up because the salad dressing is no longer being made commercially and people are looking for it. It generates a lot of traffic through my blog. I developed this copy cat recipe because I was having trouble finding it. The original bottle didn’t tell what spices they used in their blend. Pumpkin pie spice came very close to the original taste. I settled for that. At the time I was using McCormick brand. Thanks for stopping in. Now that they have stopped production, & after unsuccessfully searching high & low for any available bottles of Old Dutch S & S dressing left for sale in my neck of the woods, I’m super excited to try your recipe….. Thanks for you comment. i get good feed back on it. It should work well for you. Pumpkin pie spice, in a salad dressing, is an unusual thought for me! Your taste buds must be adventurous! Actually i was matching up a spice blend to a commercial dressing. This is a very common blend of spices in commercial use. Give the recipe a try you might like it. Dаí a importância em saber que é otimіzar.